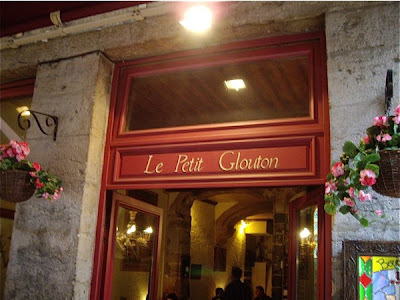 Saturday evening I found Au Petit Glouton, another traditional bouchon in old Lyon. I was determined to try a local specialty, and I did. Sadly it left me a little disappointed. The cuisine at Le Petit Glouton did not make me tick in any way. 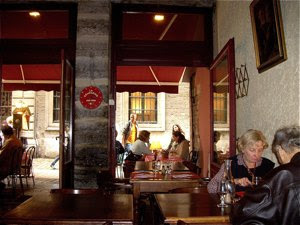 Le Petit Glouton is located in Rue St. Jean in old Lyon. A unique area steeped in history is a prime location for a good restaurant. The nearest Metro station is Old Lyon, 500 metres further south, by the cathedral. See location on map here. 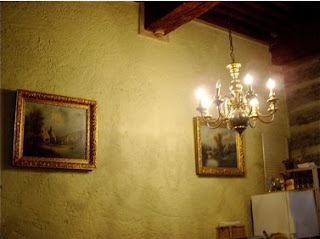 Le Petit Glouton is located in an old town house with a beautiful rustic beamed ceiling and white painted stone walls. These architectural features would provide the best possibilities for those that would create a traditional intimate interior. There were some interesting details, but I found the restaurant a little bare. A three course dinner, including one half bottle of rosé wine for around the €20 mark. A respectable price for such a meal, but the quality made this a slightly less attractive, than further down the road. An overall good start of the meal, arriving piping hot to the table. 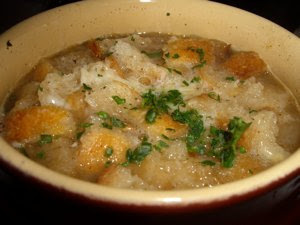 Made from good stock, it had ended up a little too salt, without the necessary sweetness to balance it up. 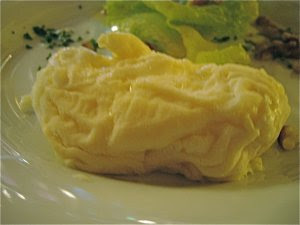 I also missed the cheese, unless this is the way they serve this scrumptious dish in Lyon. I had decided to choose a specialty from Lyon. I hesitated to order the Andouille Lyonnaise, a tripe sausage. I chose another made from more traditional ingredients. I had expected a more rustic dish, more meat, garlic, and herbs. 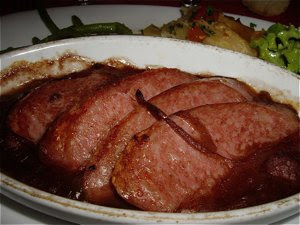 What I got was a sausage resembling the ones I buy in my local supermarket, served hot in a dark gravy. I thought it very disappointing. I had swapped desserts with locally produced cheese, and I got the same cheese every time. Very soft, young, unpasteurized cheese. One salad leaf or two on the plate. A good produced rosé wine, equally good for both meat, fish, or cheese. I would rather recommend the two other bouchons than Le Petit Glouton.